Does The Zen of Lotto Really Work? Read 2 Reviews! The Zen of Lotto eBook gives you access to 13 demo apps. 12 of these demo apps are calculators or simulators related to long-hand evaluation of lotto prediction algorithms. You get a full set of project files for each demo app along with extensive documentation. The Zen of Lotto Exposed… or Approved? Should Lotto Exposed Declare This eBook to be Exposed or Approved? As author of the eBook, I have been offered a chance to write a guest review of my own book. This article is that review. Obviously, if I claim that you can’t miss winning the very next lotto jackpot if you use my approach, LottoExposed.com would be forced to declare the eBook to be Exposed as a result of my review. But I don’t make that claim. In fact, I make it clear in the Foreword that I have not found that Holy Grail of lotto algorithms that reliably (or even sporadically) predicts the winning jackpot combination. So, based on (at least) that much full disclosure and honesty, I have some hope that Lotto Exposed might declare the eBook Approved. All that having been said, I suppose I should start writing the review. What I claim is that the tools I have developed and the understanding of the problem I have arrived at can be helpful to those who are writing their own lotto prediction code. When you are dealing with long odds (a huge number of possible algorithms with only a few that might work), the prudent approach focuses on rapid identification of odds-neutral results and elimination of the algorithms that produce those. My eBook shows you the concept of odds neutrality and guides you in the application of that concept. Frankly, with possible approaches so varied, I have to apply the concepts manually in a manner custom-designed for each algorithm. That is NOT automated in any way. There is no demo app. There is no complete set of related project files. Frequently, I do a quick mental calculation. The trick is knowing what factors to take from the output of your selection algorithm under consideration. From there, it’s a simple ratio comparison. But the extraction of these factors is not easily programmed into a general solution. Given these long odds against success in winning the jackpot using your personal computer this way, I suggest to the reader a different prize to aspire for. This prize is a deep knowledge of the topic of random number prediction. It is, to borrow from a lyric from Sting’s The Shape of My Heart, the quest for “the sacred geometry of chance”. I call this deep knowledge “the Zen of lotto”. I suspect that most readers of this article and of the eBook itself will quickly forget these ideas, focusing instead on the information about mundane math and coding. And that’s fine. The eBook gives you access to 13 demo apps. 12 of these demo apps are calculators or simulators related to long-hand evaluation of lotto prediction algorithms. You get a full set of project files for each demo app along with extensive (line-by-line, in fact) documentation. If you’re already involved in in-depth efforts to write your own lotto prediction algorithm, you might immediately recognize the usefulness of these calculators and demonstrators. Maybe you’ve already written your own version of the same app. If this is all new to you, the exercises and documentation can help you benefit from using the demo app. One concept I see bandied about with some regularity is the concept of hot/cold numbers. Some say bet for/against hot/cold. Others say bet against/for. The actuarial simulator demo app (included in eBook) lays both of these ideas to rest. In the Louisiana Lottery, the odds against a particular ball being drawn in the next drawing are always 20/3. This is not affected at all by history. Also, when you look closely at the code for the cumulative inductions calculator, this becomes apparent. To recap: Nearly all of your attempts to find the solution (except possibly the very last one!) will fail. You will spend most of your time eliminating failed attempts. The information and demo apps included in the eBook help speed up that process. That is the only claim I make regarding the product’s usefulness. Why I Wrote The Zen of Lotto? I began writing The Zen of Lotto with hopes of profiting monetarily from a hobby of 20 years. And back then, the hope of profit was the only purpose I had in mind. But, I found a higher purpose for writing as I went along. I discovered that I was still working at my hobby, advancing in it, even while at the same time thinking I was done with it. There’s nothing quite so focusing as trying to explain your work, both in general concepts and in fine detail, to others. As I was writing the eBook, I recalled things I had intended to do. When I looked back through my code, I often found I had never pursued some of these ideas. So I found myself with the full set of tools I had created and the unpursued idea fresh in mind. And guess what happened. Yep. Several of those unpursued ideas got pursued. And a few of those found their way into the text of the eBook. So, by the time I finished writing, my purpose had changed considerably. As an avid hobbyist in this area, I wanted to share my enthusiasm and the results of my extensive work with other avid hobbyists. I’m hoping to hear from one person who thinks the demo apps are “da bomb”! And I hope to hear from others actively involved in pursuing the discovery of the sacred geometry of chance. I hoped to connect with at least a few others with that Ahab-like obsession for the great-white-whale of that holy-of-holy lotto algorithm – the one that actually works! What You Will Find in My eBook? 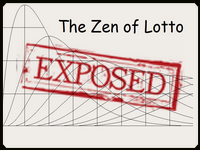 In addition to the demo apps, project files and associated documentation, The Zen of Lotto contains a full chapter of math theory and 60 unique code samples. For more information, click The Zen of Lotto and read the catalog description on amazon.com. Then click the Look Inside feature and view the sample text which goes well into the 3rd chapter. You get access to two demo apps (in the Foreword), and in chapter 3, you can access the full project files for one of those demo apps. Check out the chapter headings. Each demo app has its own chapter. The titles of those chapters give you an idea about the range of demo apps included. Look at the list of illustrations and the list of code samples. Skim the 500+ topic headings. Winning the Lotto? Where Should I Start? In The Zen of Lotto I show that every last approach I have tried is odds-neutral – in other words, totally useless as far as it applies to winning the lottery jackpot. I also show that a historical correlation 4% away from odds-neutral (1 being odds-neutral, either 1.04x or 0.96x is 4% away from that.) can be parlayed into a significant advantage. If you focus totally on hitting the lottery jackpot in the game you play, you may be missing the point. This is true whether or not you use the concepts in The Zen of Lotto. There are those who would consider this endeavor a complete waste of time. But I think that if you ever understand one thing well, it enhances your understanding of “Life, the Universe, and Everything”. Douglas Adams fans will recognize this immediately. They will also recognize the tip of the hat to him that appears in the subtitle to the eBook. If seeking “The Zen of Lotto” does not strike you as a worthy object of study, find one that is. That’s how you hit the jackpot in the great lottery that is life itself. And that is a prize more valuable than all the money that has ever been won in all the lottery jackpots, or ever will be. And if you do happen to hit the lottery jackpot, that’s ok too! Where is your winning testimonial? Ahhh, it doesn’t really help you win! You said it best, NOTHING can tell you which numbers to pick !